This is the story of the unlikely romance between C S (Jack ) Lewis, the middle-aged, bachelor Oxford don, Christian writer, and author of the ‘Narnia’ stories; and Joy Gresham an American Jewish/Christian writer and poet. Set in the male enclave of academic Oxford in the 1950’s Joy’s intellectual assertiveness delights Lewis but appals his condescending fellow academics. From tentative, timid, beginnings their friendship develops into a deep abiding love which is brutally cut short by Joy’s terminal illness. 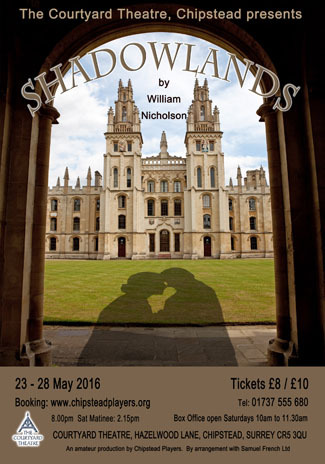 From this sombre subject William Nicholson has fashioned a beautiful, touching and gently amusing play which demonstrates the rejuvenating power of love. Page 1 (beginning) to 2 (Real life has not begun yet); Page 13 (as you see I am all prepared) to 15 (bottom-I didn’t cry); Page 53/54 (We are like blocks of stone) to end. Page 13 (As you see I am all prepared) to 15 (I didn’t cry); Page 17 (Merry Christmas) to 18 (or merely stupid! ); Page 48 (I am so happy) to 50 (Don’t talk any more. You rest). American accent. Page 9 (Will he write in my book) to (Mom. Can I leave the table); Page 53 (When I was your age) to (Me too). American accent. Page 28 (Mr Lewis. Please be seated) to 29 (every happiness in your life together). Scripts can be obtained from the production Manager, Mary Morgan, but must be returned, or brought to the Read Thru on 18 January 2016.